Why do I wake in the morning and expect this day to go as planned, “normal?” I suppose for sanity we have to assume some things will go on, the sun will rise, my heart will beat, my family will live and thrive. To think otherwise every morning would lead to madness, or at least extreme anxiety. When something abruptly changes the rhythm of things, especially when a life is ended, we are brought up short by the small part we play in making this world go around, for the day to proceed, for the breath we take. And our hearts churn. This week I ran across a text I sent last year, confirming activities in August so I could plan my mother’s 93rd birthday celebration. I had no way of knowing that only days later she would begin her journey home, and instead, celebrate that day in eternity. As the dates approached, I entered into the memories of last year, my mother’s fall and treatment in the E.R., her admission to the hospital, then the transfer the next day to hospice, and the vigil that followed until she died the following Monday. Mom lived a rich, complex life, much of it blessed. She was long past ready to go to Jesus, and she left behind a rich legacy and memories that I will never finish replaying. Still, her absence in my world is a black hole, sucking my energy with a jab of emotion whenever something triggers a scene or her voice. But my sadness is limited now. And it is balanced by my awareness of the pain of others. How can I take up residence in my own emotions when so many others need prayer, love and support? A few days ago, I stopped to talk with my next store neighbor as he entered his driveway after walking his dogs. Only the location and dogs identified the scarecrow who was a hefty and active man only months ago. Cancer and something unknown is sipping away his life. A good friend comes to church alone, the husband she anticipated growing old with in glory, instead lying in darkness in his bed, resisting her efforts to socialize. An exhausted daughter tries desperately to calm her mother, terrorized by drugs and dementia, and learns her brother has died. A child is torn from his mother, brutally sent to Jesus too soon. Her grief is set to destroy her. My heart aches for these and others I know, or am asked to pray for, as well as for those I read about in the paper and hear on the news, lives abruptly changed by violence or accident or disease. I’ve tumbled that over in my mind all weekend, my heart so troubled that sometimes I could barely walk. Lifting the ones whose burdens weighed on me to the only one who has the power to change anything, I interceded through out the day. Even during the night I woke and prayed. The pieces slipped into place. 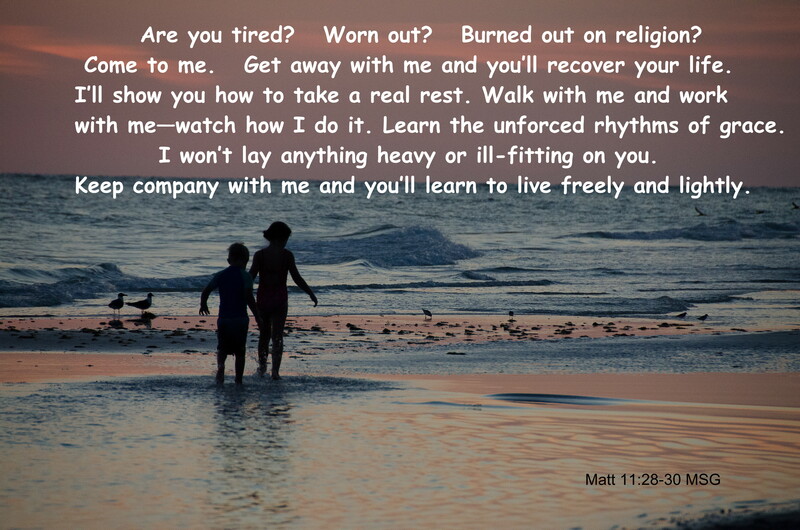 Like so many others, the command from Jesus not to let my heart be troubled is one I can’t obey on my own. I need his strength. And for me, his strength comes in song, whether singing out loud, or responding to every little thing in my life as a gift, in a song of internal thanksgiving. Once I began turning my heart toward Jesus, thanking him for the cardinals and finches playing out front, the dishwasher humming again after DH fixed it, the softness of my pillow, all the events in the lives of my children and grandchildren . . . once I started, the naming of thanks went on unassisted. And though I am still praying for those in pain, my heart is no longer troubled. Are you burdened, “heavy laden” as the old text reads? Or are you the burden-bearer, bending under the weight of it? wonderful. Thank you for sharing your thoughts and helpful advice from our Lord. Thank you, Martha. It is good to share our joys, and our sorrows. I don’t think we are meant to carry the load alone. I’m glad it is helpful for you.